Here’s a promotional gift idea that will appeal to all the ladies out there – a promotional tote bag. Every lady has a soft spot for bags, as they are one of the essentials in a woman’s everyday life! Bags can help to dress up an outfit and make a lady feel glamorous! This exclusive offer is only available for the month of November with the purchase of Jessica Magazine at the convenience stores or magazine stands in Hong Kong. Jessica magazine is a magazine for modern women that features individual sections on fashion, beauty, health and many more. Offering promotional tote bags as a gift with purchase? 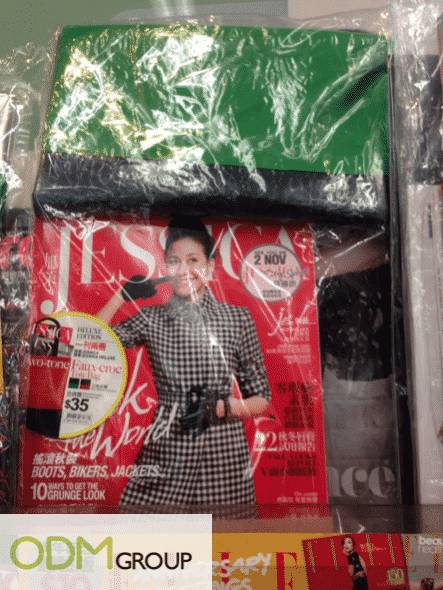 The promotional tote bag being offered by Jessica magazine is a duo-tone faux-croc tote bag that comes in two color options, red or green. The bag is worth $35 HKD and looks extremely fashionable and stylish. By offering such a promotional tote bag as a gift, it will definitely be able to attract more women to purchase their magazine in order to receive it! Not only will this help to boost your sales, it can also help to build up your magazine’s reader base as well. People who may not have heard of your magazine before might pick up this up because of the free gift and then become loyal readers of your magazine! Now, which company would not want that? Brand your promotional tote bag to increase brand recognition! By branding the promotional tote bags with your brand name and company logo, your promotional product can serve as a walking advertisement for you. Not only is this form of advertisement cost effective, it also allows you to reach a wide range of people. When your customers use the bags on the street, they will be actively promoting your brand to those around them! Your brand name will gradually become more recognized by everyone!